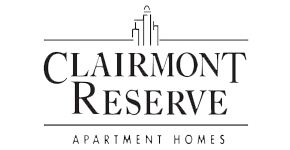 If you are looking for an apartment in a quaint neighborhood with all the amenities, Clairmont Reserve is the perfect place! Put in a great workout in our fitness center or relax by the oversized fireplace while watching your favorite program on the large screen TV in our clubroom! If you are looking for an apartment in a quaint neighborhood with all the amenities, Clairmont Reserve is your best choice for an apartment home.